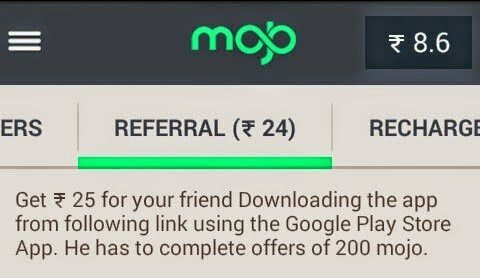 Now Mojo app offering Rs 24 (per invite) when you refer your friends, relatives, foes to download Mojo app on their android smartphones. Getting Recharge for free was never this easy. Just complete some offers and get your Free Mobile Recharge as a reward. All you will be required to do is download application and Fill up Surveys to get your reward. There are also levels (Bronze, Silver , Gold) which will expand and allow you to get new tasks which will let you earn more talktime for free. You can also earn talktime or Free recharge by just referring your Friends.